“Grow your business and learn how to sell to the State of California! 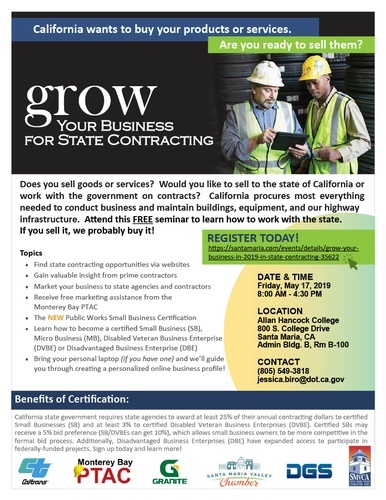 This free workshop will assist small businesses in becoming certified to bid on state government contracts. You’ll learn how to find business and contracting opportunities, gain free marketing resources, and create a personalized online business profile. Bring your laptop to this course and easily certify as a Small Business during the afternoon workshop.